Will There Ever Be Sunshine For Greyhounds? It’s illegal in 39 states. It’s cruel. 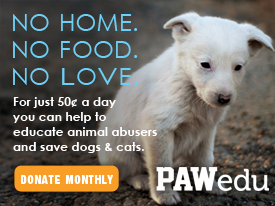 It’s animal abuse. So why are people still doing it? Greyhound racing. It may not sound particularly sinister at first glance, a group of dogs running and humans watching to see who’s the fastest. That’s probably what many Floridians were thinking when lawmakers first legalized gambling on the sport in their state in 1931. Spending a day out at the track, mingling with friends and relations, indulging in decadent snacks, cheering when a handsome dog bounded gracefully across the finish line. What could ever spoil such a glorious occasion? Spending about twenty hours behind bars, not knowing why you’re there, barely able to stand up, let alone move around. Nothing to look at but a wall, occasional passers-by, maybe a few others like you who are trapped, cramped, and confused. An unidentifiable, uncooked, smelly brownish lump to eat every once in a while, and a bathroom break here and there after it’s made its way through your system. And, if you’re lucky, a chance every so often to chase after a fuzzy thing on a stick, if you have the energy. As sad as it sounds, this is the reality for thousands of greyhounds in the U.S., day in and day out. However, more than half of the remaining 21 tracks in the U.S. are located in Florida, a state which does not require race tracks to report their dogs’ injuries, and which has less than stellar standards when it comes to issuing licenses to racing dog owners. According to a new investigation by the Miami Herald’s capital bureau chief, Mary Ellen Klas, the state has denied 115 license applications from convicted felons within the past year, but has granted licenses to 80 other convicted felons known to have been involved in such crimes as assault, battery, and illegal drug possession. 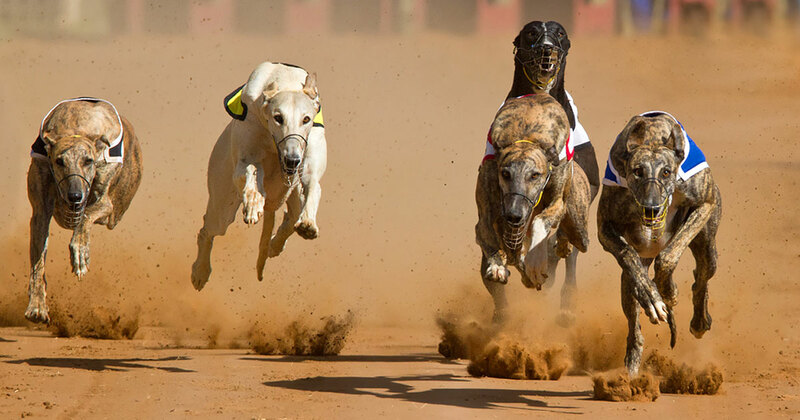 Racing greyhounds are often physically abused, neglected, and sometimes given illicit stimulants like cocaine in order to enhance their performance. When owners or trainers of the dogs are discovered to be mistreating the animals, authorities such as the Division of Pari-Mutuel Wagering, the National Greyhound Association, and the state of Florida are supposed to spring into action, investigating the cases and imposing varying degrees of penalties on the perpetrators. But sometimes it can take as many as two to three years for a case of greyhound abuse to be properly processed. According to Carey Thiel, the executive director for Grey2K USA, a non-profit organization dedicated to the welfare of racing greyhounds, Florida is much slower at resolving abused greyhound cases than any other state in which they still occur. “There’s literally no other state we work with where you see a delay like this,” he stated in Klas’s article. The true cause for the stagnant justice procedures is unknown, but there’s no question that the greyhound racing industry has several faults which desperately need to be addressed. Why, Then, Has It Not Been Shut Down Completely? One problem is that Florida laws often require greyhound race tracks to hold a minimum number of events each year in order to keep their licenses, whether they want to run the races or not. Most of the tracks still in operation in the U.S. make the bulk of their profits from on-site casino gambling and card rooms they’ve added over the years, which have become vastly more lucrative and popular than the dog races themselves. However, the phasing-out of greyhound racing would result in significant financial losses for dog breeders, trainers, and track employees, so there has been extensive lobbying to keep Florida’s greyhound racing business in operation. Another big problem, and a likely cause for their unfortunate circumstances, is that greyhounds bred for racing are viewed by their owners as mere commodities—money-making objects undeserving of any sympathy or understanding. For the sheer love of it? Well, what dog wouldn’t want to run around and get some exercise after being kept in a 42-by-31-inch cage for as many as 20 hours each and every day? That’s the standard minimum size for a greyhound enclosure, and the type many of these unfortunate animals have to spend their days in. Sometimes the enclosure areas aren’t air conditioned, and their canine residents are forced to endure sweltering heat, along with ticks and intestinal parasites if the owner can’t keep up with vet exams. Research conducted by Grey2K USA has shown that the shortcomings of racing greyhound nutrition can also be hard to stomach. Due to claims by industry professionals that it’s an optimal performance food, many greyhounds are fed raw mystery meat commonly referred to as “4-D”: sourced from dying, diseased, disabled, and dead livestock. 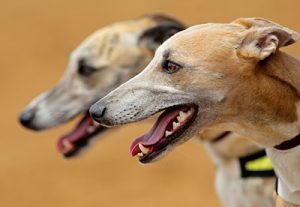 The Greyhound Racing Association of America argues through their website that “4-D” meat has a low risk of contamination when it’s “purchased from a reliable packing facility and handled correctly,” but there’s no guarantee that all greyhound food is coming from such sources, even if that’s true. (Their website goes on to refer to their recommended greyhound diet as “Bones and Raw Food,” abbreviating the name as “B.A.R.F.” ) Sounds appealing. No human would want to be forced into such horrible conditions, and no animal deserves to have that decision made for them either. In 1987, members of several retired greyhound adoption centers across the country came together to form Greyhound Pets of America, the first national greyhound adoption organization in the U.S.
One of the most successful centers, throughout their 27 years of operation, they have found homes for over 80,000 retired racers. With chapters in highly populated areas like Melbourne, Daytona Beach, Orlando, West Palm Beach, and Tampa Bay, they have the potential to connect the thousands of retired or rescued greyhounds who need homes to loving owners, if people are only willing to take them into their hearts. What’s your opinion of greyhound racing — should racing tracks be shut down?